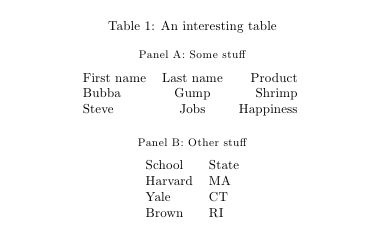 I would like the 3 columns of Panel A and the 2 columns of Panel B to fill the horizontal space of the table. I imagined using two different \tabular commands within a \table would work, but it doesn't. I also found the subfigure package, but I think that only lets you stack tables horizontally, not vertically. Here I used the subcaption packages. A good alternative is the subfig package. However, the subfigure package is obsolete. Since the two panels are contained in the same tabular, they span the same width. The above uses the booktabs package for presentation of the tabular environments. However, it is not necessarily needed. If you want to drop it, you should also drop/replace the \toprule, \midrule and \bottomrule rules with \hline or another preference. You can use the multicol column package to have data span multiple columns. Not the answer you're looking for? Browse other questions tagged tables formatting or ask your own question. Divide long table into two parts.